This isn't vacation days spent. This is bragging rights earned. Get your bucket lists ready, because Perfect Day at CocoCay is set to open in May and is packed with first of their kind thrills and one of a kind ways to chill — only on Royal Caribbean®. Come Seek the Royal Caribbean®. Lock in a great rate and book this cruise by April 19, 2019 to receive an exclusive $50 Onboard Credit per stateroom! Receive Great Pricing and Exclusive $50 Onboard Credit per stateroom! This isn’t vacation days spent. This is bragging rights earned. Conquer the tallest waterslide in North America and snap a shot from up to 450 feet up in a helium balloon. 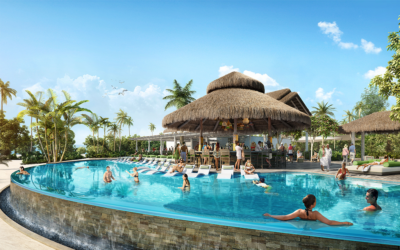 Grab a drink at the swim-up bar and soak up the scene in the largest freshwater pool in the Bahamas. Or get a taste of Bora Bora with your own overwater cabana. This is Perfect Day at CocoCay — only on Royal Caribbean®. Debuting May 2019. Puerto Rico’s 500-year-old capital is a history buff’s dream come true. The Spanish settled this harbor as a New World home base, and that influence is still evident, from the fortress walls lining the coastline to the rainbow of colonial buildings along narrow streets. Venture further out from the old town and nature unfolds. You can scale high into the jungled mountains of El Yunque Forest, or keep to the foothills on a riverside horseback ride. If despacito is more your speed, pick a pristine beach and recline with codfish fritter and rum drink in hand. San Juan cruises give you the perfect outpost to dial up or dial down your vacation. What makes St. Maarten so unique is its blend of cultures. The island is home to 120 different nationalities speaking over 80 languages, and is governed by two countries: the Netherlands and France. In fact, it’s the smallest land mass in the world to be shared by two different nations. While it may be less than 40 square miles, there’s plenty to do on this little island: you can travel back in time while exploring centuries-old ruins and get your adrenaline fix ziplining through lush tropical forests. If you’re after a little rest and relaxation during your cruise to St. Maarten, you’ll find plenty of secluded beaches where you can work on your suntan before treating your taste buds to some of the best cuisine in the Caribbean. Prices are per person based on double occupancy, availability and subject to change without notice. Taxes, fees and port expenses are additional at approximately $103.57 per person. Amenity promotion can be pulled at any time without notice. Ships’ registry: The Bahamas.